Two (2) 18th Cent. Irish Last Will and Testaments, including George Evans, 3rd Baron Carbery. 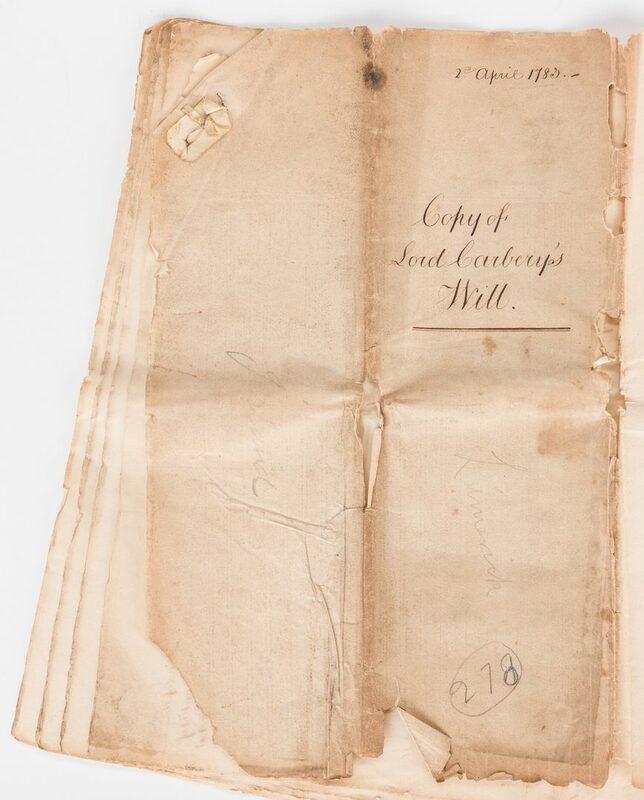 1st item: Copy of the Last Will and Testament of George Evans, 3rd Baron Carbery (d. 1783). Seven single-sided sheets bound at top left corner with additional cover sheet. George's wife, Elizabeth Lady Carbery is the primary benefactor. He also acknowledges his brother the Honorable John Evans, the Reverend Edward Owen of Blathewick, Northampton, Thomas Boyson, "now living in my service", Owen Dignan, his former under gardener, and Thomas Milley, his gamekeeper. While his son George Evans, 4th Baron Carbery (1766-1804) was named to inherit the title upon his father's death, he also left the unentailed portion of his Irish estates to his daughter in the event that George died without heirs, a contingency that came to pass when his son died in 1804 with no heirs. 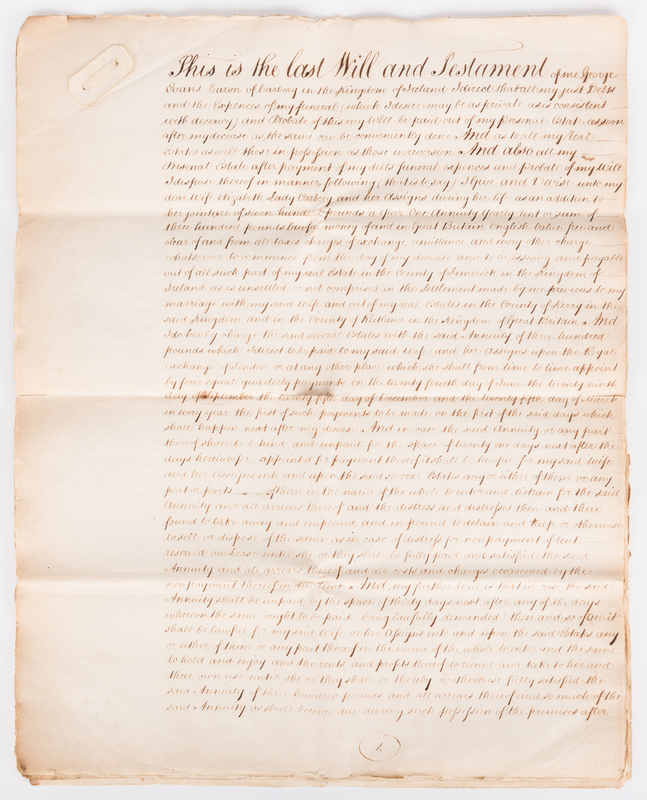 He charges his executors, William Fitzwilliam [Uncle of Lord Viscount Fitzwilliam of the Kingdom of Ireland], David Roche, Abraham Robarts, Jeremiah Jackson, and Hugh Jackson, with "all my said unsettled Real Estates in the counties of Limerick and Kerry in the said Kingdom of Ireland and all my Real Estate in the County of Rutland in the Kingdom of Great Britain subject to and chargeable with all the aforesaid Annuities unto…for the term of ninety nine years to commence from the day of my decease…". 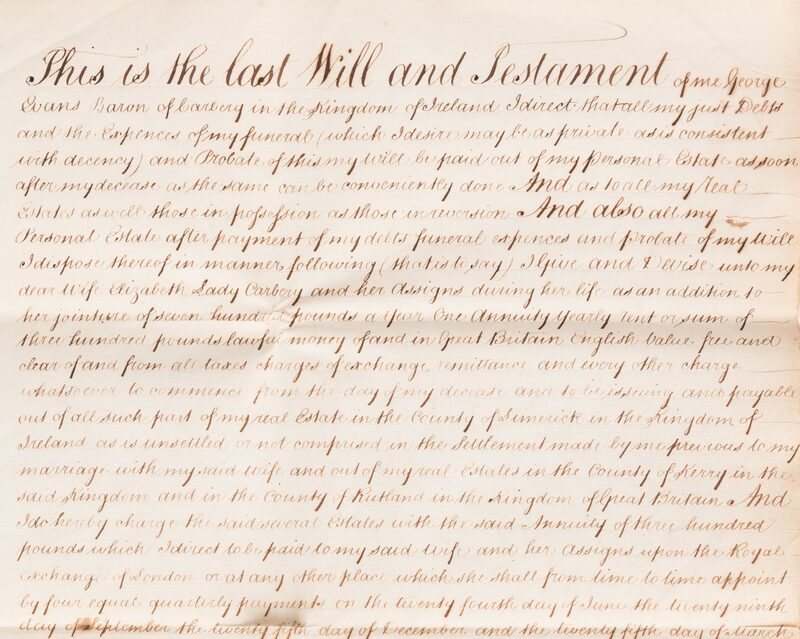 The will was "Signed Sealed published and declared by the said Testator George Lord Baron of Carbery as and for his last will and Testament in the presence of each other have subscribed our names as witnesses, W. Reddall of Duddington Gentn._R. Allen of Bulwick Officer of Excise_J. Henson C[lerk] to Mr. Jackson of Stamford_" dated April 2, 1783. 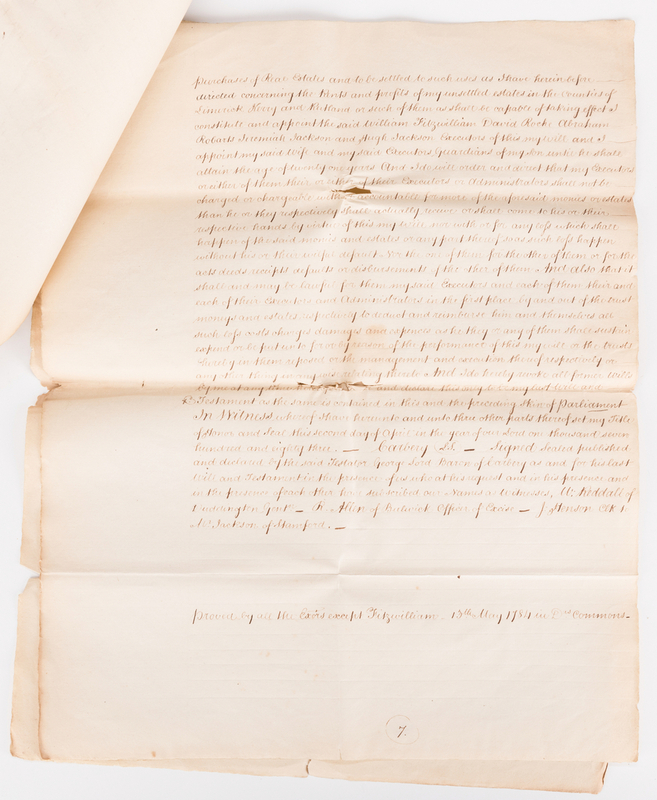 Below is written "proved by all the [executors] except Fitzwilliam – 13th May 1784 in Drs. Commons -". Partially folded – 13 1/8" H x 4 3/8" W. Unfolded – 16 1/2" H x 13 1/8" W. 2nd item: Copy of the Last Will and Testament of Roger Palmer of Palmerston in the County of Mayo, son of Elizabeth Echlin and Francis Palmer, (d. 1811). Seven single-sided sheets pinned at top left corner with additional cover sheet. 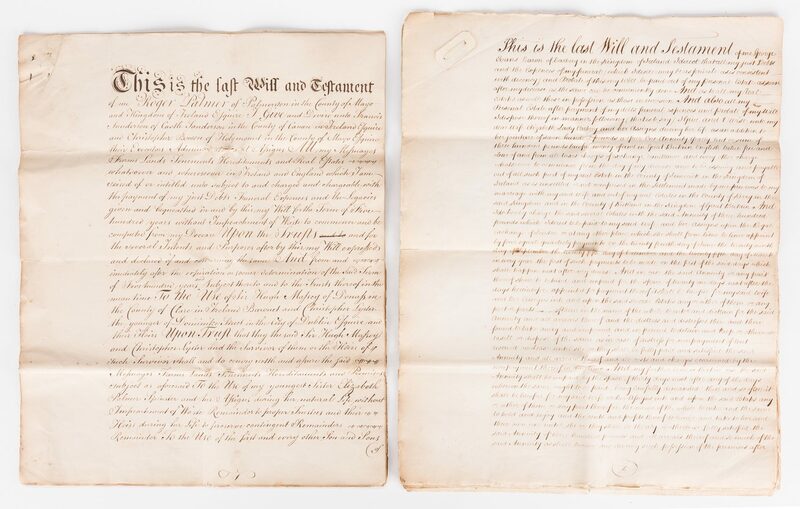 Francis Saunderson of Saunderson Castle, and Christopher Bowen, of Hollymount in the County of Mayo, are designated as the primary benefactors of "…farm lands, tenements, hereditaments, and real e[s]tates whatsoever and wheresoever in Ireland and England". Sir Roger Palmer of Castle Lackin, his heirs, and his brother Francis Palmer are to receive Kenure House, of the town of Rush. 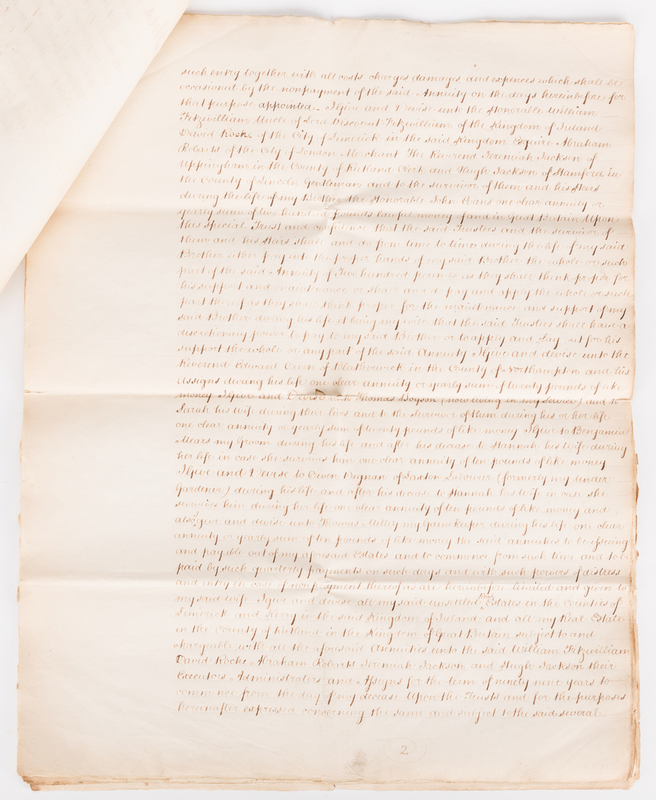 He also acknowledges his sisters Elizabeth Palmer and Frances Stafford, and her husband Edward Smith Stafford, "or any future husband", his mother Elizabeth Palmer, in addition to his servant Anthony Mewes. 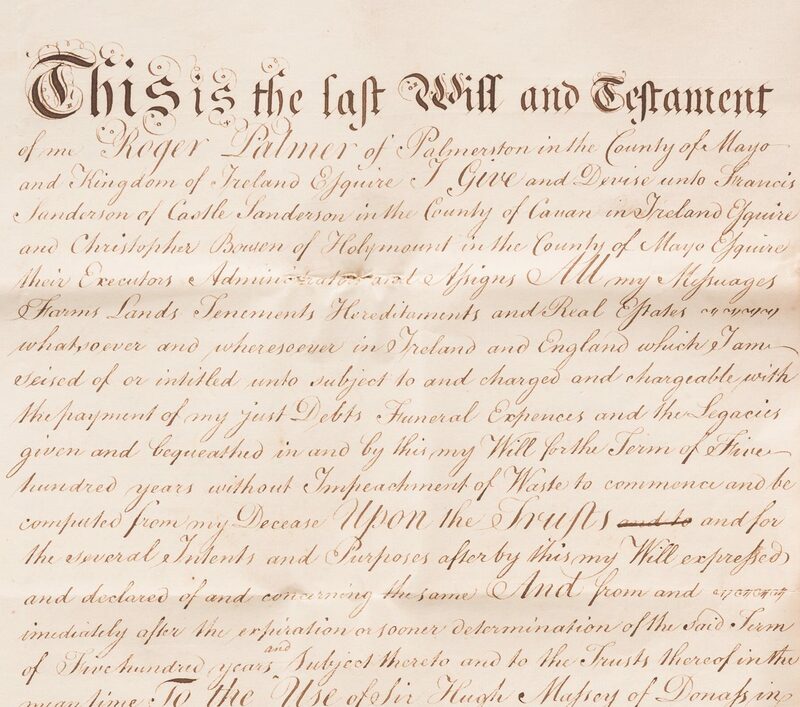 The end of the documents reads, "I do hereby constitute and appoint the said Sir Hugh Ma[s]sey [of Clare County], Christopher Lyster ["the younger of Dominike [sic] Street", Dublin], and my said Sister Elizabeth Palmer Executors and Executrix of this my last Will and Testament" dated 1780. Partially folded – 12 3/4" H x 4 3/8" W. Unfolded – 16" H x 12 3/4" W. Biography (courtesy Ask About Ireland): On Roger Palmer's deathbed in 1811, he bequeathed what is known in Rush as the 'May Money'. 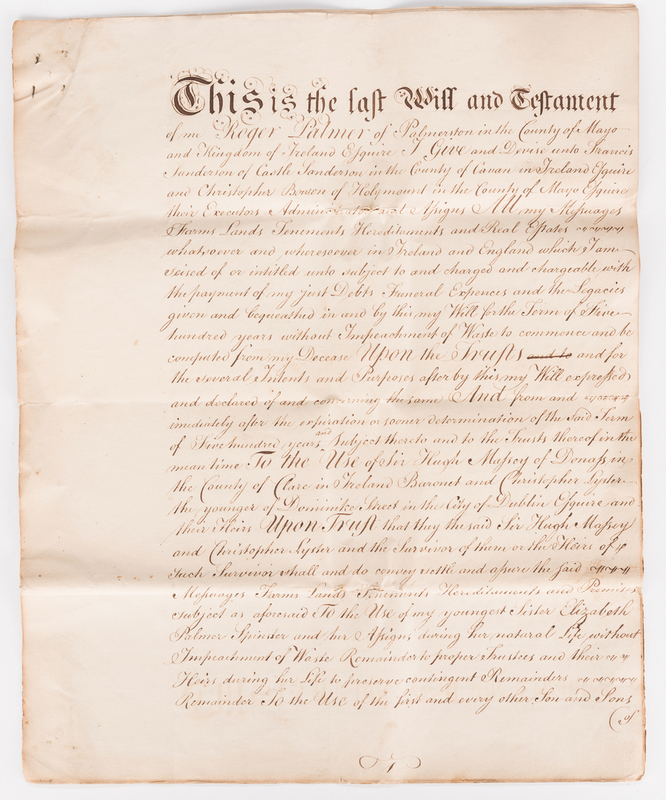 He bequeathed '£2,500 sterling to be laid out in Ireland in proper securities at 6% p.a. 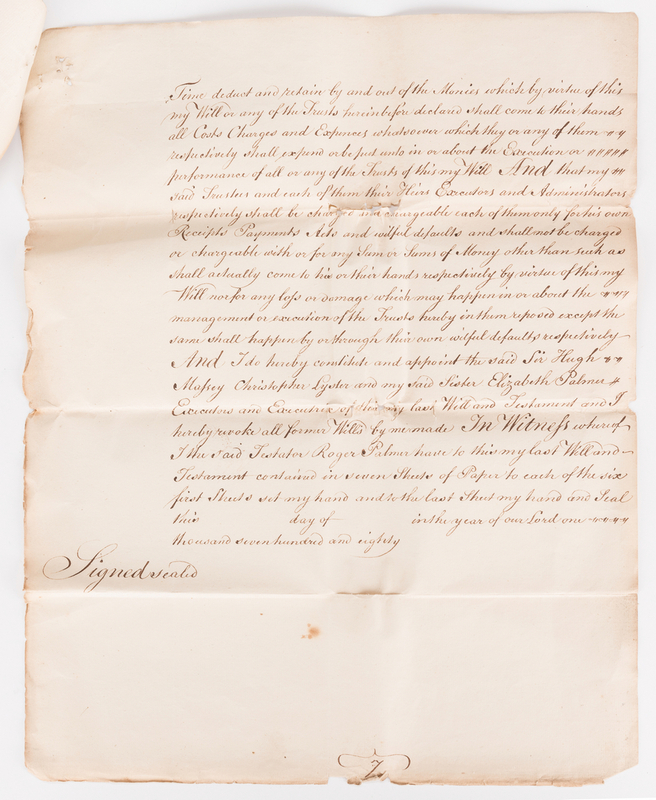 compound interest, and I desire that the interest be employed every succeeding year, in the month of May, for the purpose of giving a marriage gift to ten women, never married, between the ages of 20 and 32 years, at the rate of £10 each. CONDITION: Overall good condition. 1st item: Overall toning and minute tears, edges of sheets. Tears, largest 1 3/4", center fold lines. Toning and foxing spots, largest 1", surface of sheets. Cover sheet in fragmentary condition. 2nd item: Overall toning, edges of sheets. Tears, largest 1 3/4", center fold lines. Minute foxing spots, surface of sheets. Areas of toning and dampstaining, largest 6 1/4" , visible en verso of 7th page. Cover sheet in fragmentary condition.